I was so shocked and deeply troubled to the point of feeling sick in the stomach when I recently saw the viral video of a young mother who repeatedly slapped her wailing baby while they were lying on the hospital bed. According to the last update from GMA News, “the Department of Social Welfare and Development confirmed that the mother seen slapping her newborn baby in a viral video was suffering from postpartum depression." The baby is already under their custody while the mother is still in the hospital being further checked for any possible psychological conditions. The hospital was also under investigation and made accountable for the incident. This is just one of the thousand cases of mothers who either hurt themselves or their babies due to postpartum depression and it’s about time that we should be fully-loaded with information and knowledge on how to combat or even prevent it before this will happen again. This article is not just intended for new mothers or soon-to-be mothers out there, but also for everyone to fully understand that this type of depression is serious but one can easily intervene and be empowered to prevent babies from further harm. According to the US National Library of Medicine, mothers with postpartum depression may feel hopeless or worthless, and "may have thoughts of hurting [themselves] or the baby." It also a point of "hormonal and physical changes after birth and the stress of caring for a new baby may play a role" in leading to postpartum depression. Just to set things clearer, although postpartum depression and baby blues share many symptoms like mood changes, constant crying and emotional vulnerabilities, sadness, insomnia, and irritability, agitation and the feeling of being inadequate; baby blues affect 70-80 percent of new mothers, wherein it begins a few days to a week after delivery and generally lasts no longer than two weeks. Baby blues are temporary, normal, short-lived state of feeling down, weepy or even moody that is caused by hormonal changes after giving birth. 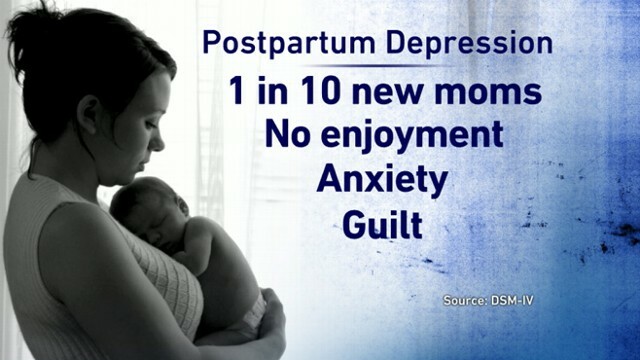 Postpartum depression on the other hand lasts more than two weeks with a more intense feeling and the symptoms are more severe such as suicidal thoughts or an inability to care for your newborn to the extent of hurting or harming the baby just like what happened to the video. About 10 to 15 percent of new moms may experience clinical depression, anxiety, or obsessive-compulsive disorder (OCD) associated to postpartum depression. According to research, there’s no single cause for this type of depression but rather a combination of hormonal, biochemical, environmental, psychological, and genetic factors. This is a long-lasting depression and it needs serious attention, even medical assistance and treatment. The truth is, either it is baby blues or postpartum depression, a lot of mothers are hesitant or embarrassed to admit it because of the guilt (feeling ungrateful for having the baby), the nagging feeling of being inadequate to take good care of your baby and to deal with your emotions all at the same time. Indeed, meeting and finally having your baby is one of the most special and amazing moments in a woman’s life yet it is also the most challenging time because of the fast paced transition from birthing to motherhood. Apart from that, several factors like traumatic birth, challenges of breastfeeding, sleep deprivation, physical and hormonal changes, and not enough spousal or family support at home can also add up to the depression. If you have any of those, especially the feeling of harming yourself or the baby, it is best to schedule an appointment with your physician so that early intervention and treatment will be administered. 1. To admit is the most important step. This definitely will not only save you but it also helps you spare your baby from any harm. To admit that you are dealing with postpartum depression is the best thing to do in order for you to be medically assisted. You have to help yourself in order to overcome it. 2. Your baby doesn’t have any idea of what you are going through. Your baby is a blessing. And no matter how hard and strenuous being a mother is, always remember that your baby is not the one who caused you this postpartum depression. He or she doesn’t have any clue of what you are dealing with. So don’t ever think of hurting yourself or your baby. Instead, focus on the joy that your baby can bring to your life. He or she is a gift and you are carefully chosen above all others to take good care of him. 3. Get enough sleep. Often, anxiety, fatigue, stress and all other types of depression is associated with lack of rest or sleep. Yes, having a newborn can really be exhausting but you still need to rest or sleep for several hours in order to revive and restore your energy. Some may say that it isn’t possible, and I even read that it takes 2 years before a mother can actually sleep at least 6-8 hours but I believe that we can defy that by asking help. Ask your spouse, or an immediate family to look after your baby while you try to catch some sleep. You can also ask a doula or a baby sitter if you can afford it. Try your best to sleep and get as much rest as possible while your baby is fast asleep. 4. Don’t pressure yourself. Multi-tasking doesn’t work. Don’t try to push things out in a way that you will end up exhausted. Remember, you just gave birth. Your body is still on the process of adjusting after 9 months of pregnancy, so as your hormones. So the main focus right now is to take good care of your baby as well as yourself. Household chores can be divided with your spouse, or you can ask for help from family members. If you are on a maternity leave, don’t think about work. Spare yourself from any worries and fears, instead relax and celebrate each passing day with your baby. Worrying wouldn’t help you a bit and it can even give you more stress. So just let it be. 5. You need an emotional support. Don’t keep it yourself. It is but normal to feel down given all the factors that causes postpartum depression. Just let it all out. Talk to your husband about it. You can share it to your closest friend, especially someone who already has a child so that she can also give you pieces of advice on how to deal with it. Join some mother forums to accumulate as much information to go through this stage. You have to find the love and comfort from your baby. Above all, pray. No one can give you the utmost help except from the Lord who gave you this blessing in the first place. God can heal and He gives the strength that you need with your journey. If you are worried about fears, responsibilities and even finances, just surrender everything to the Lord. He is the Lord of Provision and He will take good care of your entire household. 1. Be the first to encourage your wife to seek for medical help. If you think that your wife or spouse has indications of PPD, try to reassure her to ask for an expert’s advice. Just like I mentioned, a lot of new moms are in denial because they are embarrassed to admit, so try to be extra sensitive about your spouse’s emotional changes because she might be dealing with postpartum depression without her knowing. 2. Be supportive. Don’t wait for your wife to open only when she is already on the most severe state of the postpartum depression. Just like the saying “prevention is better than cure,” it’s best to intervene than being sorry when it’s already too late. Every end of the day, try as much as needed to talk things through, especially how she feels with motherhood, her difficulties and challenges in order to address them properly. Parenting is a team work, it should be shared, all of its ups and downs. So don’t let your partner, or wife feel that she is just alone with it. 3. Don’t leave her alone. Postpartum depression can be hard but give your partner all the help that she needs and try not to judge her. Make sure that she gets all proper treatment and care which are vital towards a fast recovery. If she is irritable or agitated, focus instead on the hormones that are causing this to her, not her directly. Just like focus on the sin, not the sinner. Make sure that you help her with the household chores and even in taking care of your newborn as much as needed. I know it’s hard to work twice as much when you have a baby but this doesn’t really last that long. Postpartum depression and even the adjustment stage will soon pass so try to hold your horses while you can. 1. Just like the husband, be supportive. Encouragement and emotional support is badly needed while dealing with postpartum depression so try give as much support as possible to your family member who has PPD in order for them to overcome it. 2. Volunteer to help with the chores. Being a new mother and taking good care of her baby requires a lot of focus, time and energy. What more if a family member has postpartum depression? Help, especially when it comes to basic household chores is greatly required. Try to lend an extra hand in doing the laundry, washing used milk bottles, and even to watch over the baby while the new mom catches sleep. Household chores are tedious and can add to the stress so any help will go an extra mile. 3. Try to intervene. If you think that your relative with postpartum depression has the tendency to hurt her baby, try to separate them immediately especially if she is highly strung or shows indications of irritability. This gives her the chance to breathe and calms herself. If you suspect that a friend or loved one has postpartum depression, help them seek medical attention immediately. Being a mother myself, I must admit that I have dealt with these crazy hormonal changes and baby blues too and it never was easy. I am just thankful that it soon passed and did not develop into a postpartum depression. PPD needs serious attention and immediate actions. We don’t need another viral video of a mother hurting her baby. Being pro-active (not in taking a video of a possible incident and to make it viral) but being involved with your friends and loved ones, especially if there are manifested symptoms of postpartum depression is definitely essential to prevent it from taking place. In the end, prevention comes hand in hand with the mother, husband, family members and even the community. Get as much information from different resources like online, from your health centers and even your doctor. Remember, babies are wonderful creations carefully designed towards perfection---so as mothers.